Since Pope Benedict XVI launched the year of faith many writers have reflected on this topic through different ways in order to help people face life challenges in the light of faith. Usually strong faith experiences are related to strongly difficult experiences; we need just to think of Abraham, Isaiah, Elijah, Jesus and the Apostles in the New Testament in order to realize this. If some welcome suffering as God’s trial in line with Job’s perspective (Book of Job), others find it difficult to reconcile faith and suffering precisely because suffering challenges faith; in this case, people tend to question and complain about everything in their life. However, in his Encyclical “Salvifici Doloris”, Pope John Paul II affirms that “suffering seems to be, and is, almost inseparable from man’s earthly existence.” (Salvifici Doloris, p. 5). The field of suffering is much wider, more varied and multi-dimensional because suffering is not something to be situated only in its physical aspects (physical suffering), but it is still wider than sickness, more complex and at the same time still more deeply rooted in humanity itself (moral suffering) affirms the Pope. If you do not experience physical suffering, you may be experiencing this at moral level such as fear of death, lack of offspring, nostalgia of homeland, the remorse of conscience, the difficulty of understanding why the wicked prosper and the just suffer, the misfortune of one’s country. This article is not intended to explain “the why” of human suffering which can be found in the book of Job and Jesus’ sufferings, but to show how one may deal with physical suffering especially serious illness without falling into despair. There is nothing else that can totally change the life of someone forever than illness; because it brings major and insurmountable changes to be acknowledged and dealt with. In face of serious illness, human beings develop two tendencies: some humbly, meekly and graciously accept the physical limitations without questioning or complain; they simply modify their behavior and adjust to the new situation. Others on the contrary, try desperately to throw off, to deny the limitations and live as if nothing happened. Those who do not acknowledge the limitations imposed to them by the current illness, worsen faster their health. In her testimony on how to deal with chronic illness, Barbara Joseph does not mind admitting the fact that by ignoring the effects of Scleroderma in her body and doing what she used to do, she had her health worsened faster. (Living with chronic illness. In Liguorian 2000). She added further that “As Christian, we can contemplate and find strength in the life, death and resurrection of Jesus, and we can follow his example which leads to new life”. Facing and dealing with serious illness in faith, give them another meaning and make those who are suffering happier. Based on her own experience of living with scleroderma for many years, Barbara pointed out five steps to follow in dealing with physical limitations. The best way to be healed passes through the fact of naming your reality without fear or shame. The doctor cannot cure a disease for which the patient did not complain about in advance. Naming the reality in which you are living implies courage and strong personality to accept the result of your medical examination without remorse of conscience or hiding it. This demands the courage to face stoically the new challenges of new life as it does not depend on your good will. For Barbara, you deal better with the things that you name than with those that remain unnamed. In the garden of Gethsemane, our Lord Jesus named his reality before his Father when he prayed “Father, if you are willing remove this cup from me; yet, not my will but yours be done” (Lk 22:42) Luke goes on to tell us that an Angel from heaven appeared to Jesus to strengthen him. If you bring your reality before God, he will also give you strength to face it properly. 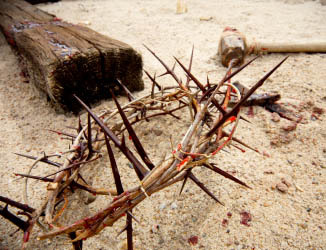 As the cross was not the end of Jesus’ life, so the physical limitation cannot put a full stop on your life. In this sense, the illness may be a sign that brings you closer to God by trusting Him in everything as it written in the book of Proverbs 3:5. Since you are living with physical limitations, you should also forget about your glorious past and actions performed when you were healthy. This was the past tense, what used to be is no more. This third step must be faced in faith because the risk is to think that you are now an empty shell, a useless presence in the world since you are currently stuck in bed or wheel-chair. This time of inactivity must be dedicated to God through prayers and simple services. For the millions who struggle with physical limitations, the good news is that life exists beyond those simple and short lived limitations. As you cannot do what you used to do, now it is time to explore other areas of service according to your possibilities and health. During this specific period of our life, God also tries to strengthen you by giving you everything you need; including gifts to replace the ones you have lost, affirms Barbara. This fourth step pushes you to assume new identity and take a long look at yourself by deciding what you are going to be from this time on. The new reality to be assumed must not be defined by doing, but by being. If in the past you valued for your actions and doings, from now on you are called to value thanks to your presence. It is now time to listen to the world of God, to be compassionate, prayerful and trusting child of God. Accepting the challenges of new situation makes us happier in dealing with physical limitations. Acknowledging that despite your limitations, God still has a wonderful plan upon your life is more valued than any medicine you get. No one wants either to suffer or to experience physical limitations that change totally our life in different aspects. As it does not depend on you, you are invited to find ways to deal happily with what you cannot avoid by your own means. Suffering might lead you to experience emptiness and uselessness in your earthly existence, yet it may also become a great opportunity to strengthen your relationship with God and find meaning in it all. The example of Barbara Joseph, who is living happily with scleroderma by following those five steps above, may inspire you to have another look on physical limitations.